Located at water’s edge and tucked among huge cedar trees, Mermaid’s Landing cottages offer affordable accommodations in a relaxed setting. Enjoy watching the birds feeding from the dock just after sunrise or whenever the tide is out. Spend your day sunning or reading in the yard or walk the island exploring local attractions. Shopping and sight-seeing in this historic town is a must. Mermaids Landing is a seven-block walk to the public beach in front of city park, dock, fishing pier, restaurants and shops. 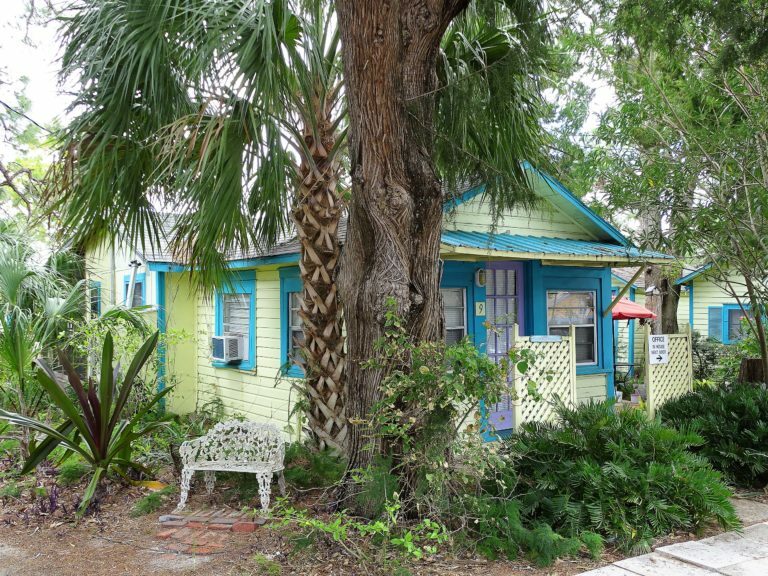 Discover the unspoiled beauty of old Florida and the slower pace of life at this quiet hideaway. You will leave relaxed and refreshed anticipating your return. Choose from nine quaint cracker-style cottages painted in colorful beach hues stand at the waters edge or beneath the shade of giant cedar trees. Built in the late 1940s and early 1950s, the cottages have been updated with the comfort of modern amenities while retaining many of their original features such as painted wood floors and natural yellow pine paneling. Most of our cottages have new appliances and new beds.